Therapeutic horseback riding is the use of horses and equine-assisted activities in order to achieve goals that enhance physical, emotional, social, cognitive, behavioral and educational skills for people who have disabilities. It not only focuses on the therapeutic riding skills but also the development of a relationship between horse and rider. 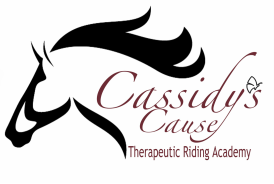 It uses a team approach in order to provide treatment for the individual with the guidance of riding instructor. Horses provide a unique neuromuscular stimulation when being ridden through their one of a kind movement. Horses move in a rhythmic motion that mimics the human movement of walking. While riding, the horses stride acts to move the rider's pelvis in the same rotation and side-to-side movement that occurs when walking. The horses adjustable gait promotes riders to constantly adjust the speed to achieve the desired pelvic motion while promoting strength, balance, coordination, flexibility and confidence. One does not have to ride to achieve the desired effects of therapy. Horses can act as an aid by giving those with disabilities a companion to care for. Grooming such as brushing, bathing, and currying aid in joint range of motion and have a relaxing and calming effect. The amount of benefit gained through therapeutic riding differs from person to person based on many factors such as the type of disability, severity of disability, motivation of the rider and connection between horse and rider. Unlike exercise machines that only focus on one muscle group at a time and do not use natural body movements, riding forces the rider to make use of the entire body to steer, control, adjust the horse and maintain balance. Because horses require not only physical skill but also cognitive skill for achievement, riding reveals the strengths and weaknesses of the rider. While most traditional therapeutic techniques often reach a plateau where the patient may lose motivation, the pleasure and excitement of riding acts to encourage patients to work through the pain and discomfort. The act of accomplishing something many able-bodied people are afraid to try is a benefit to those with disabilities in itself. In an eight week study on the effects of a therapeutic riding program with participants ranging from ages 10 to 40, a significant change in four out of eight measures of sitting posture was shown. In addition, the results of a recent a ten week study on therapeutic riding showed and improvement in sense of self-efficacy and self-esteem in adults ages 26 to 46 with psychiatric disabilities. Similarly, an additional study of 22 adults ages 17 to 6 with a variety of physical impairments reported increased physical self-efficacy and behavioral self-confidence following a 12 week therapeutic riding program. Therapeutic horseback riding has been used to help people with autism. Especially for autistic children. This activity is said to benefit the communication, motor skills, and social skills of an autistic person. It also causes improvement in responses to verbal and external stimuli and relaxation. People with autism cannot ignore one sense and let another take over the way most people can. Instead, they see, smell, hear, taste, and feel, and think all at once giving them sort of a sensory overload that they cannot handle. Riding a horse helps them concentrate on just the task they are doing rather than everything all at once. Equine assisted activities work almost like a reward system. When a child with poor communication skills wants the horse to walk they have to use a verbal command to move the horse forward it gives them incentive to give that command. Also, they will begin to build a bond with the horse and also with the handlers of that horse. Although the horses are led during lessons they learn to pull the reins to move the horse to one direction or another. These could be reaching down to grab something or giving the handler a high-five. Individuals with autism will learn to interact with the horses handlers to convey to them what they want the horse to do. If they want the horse to walk they have to learn from the handler how to ask the horse to do that. Also, it helps them to focus on something outside from themselves which is a difficulty for people with autism.